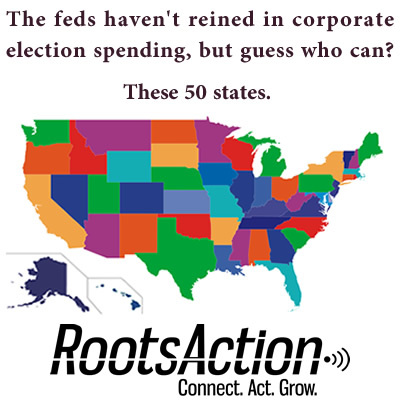 Every corporation based in your state could be seriously restricted or even stopped in its spending on elections, including federal elections. Our state can and should use the model created by Maryland State Senator Jamie Raskin to rein in spending on all elections by corporations based here. Part 3 of the "Shareholders United" Act is the key. 1. Corporations cannot spend any resources on political campaigns and candidates without showing that there has been a prior majority vote of shareholders authorizing political spending by management and expressing the partisan political preferences of the shareholders. 2. Any corporate political expenditures or contributions must be posted on the company website within 48 hours. 3. If a majority of a company's shares are owned by large institutional investors that cannot take political positions -- like state and local pension funds, mutual funds, insurance companies, foundations, churches, and universities -- then the corporation cannot make political expenditures or contributions. 4. Shareholders have the right to request a pro rata rebate for that portion of their investments spent by the corporation on any political expenditures and contributions they disagree with. Please work to pass the "Shareholders United" Act in our state.